New Delhi: Procedural and infrastructure delays have upset the plans of NTPC Ltd, India’s largest power generation company, to achieve fuel security and reduce dependence on Coal India Ltd (CIL), the primary coal supplier. NTPC will not be able to begin production from the first of its captive coal blocks at Pakhri Barwadih in Jharkhand as planned by December this year. 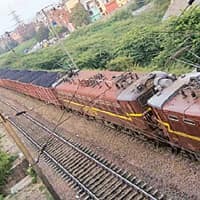 “Due to a delayed land acquisition notice (issued) by the coal ministry and the absence of a railway link, we do not see anything happening shortly," a senior NTPC executive, who did not wish to be identified, said. The Indian Railways has informed the state-owned company that the proposed 80km rail link to Pakhri Barwadih cannot be provided earlier than 2009-10. However, a senior coal ministry official, who did not wish to be identified, countered NTPC’s claim and said, “The land acquisition notice has already been issued. There was no intentional delay on the part of the coal ministry. It has also been observed that there was no consistency in the proposals submitted by NTPC and every time the proposals have been submitted with a different quantum of land. NTPC is trying to blame others for their inaction." NTPC’s coal production plans from its captive blocks is part of the company’s strategy to ensure a stable source for its energy, including coal and gas, needs. Especially, since it will help cushion the impact of supply and pricing disruptions. The delay assumes greater significance in view of a recent proposal by CIL to hike coal prices by 10%, which was later turned down by the Prime Minister’s Office. Coal is critical for NTPC, as over 80% of its installed capacity of 27,404MW is coal-based. “Delay in land acquisition authorization to NTPC is certain to disrupt the strategic plans for the power utility to secure coal supplies from captive mines. The time frames for preparatory works for mine development, appointment of a coal mining contractor, construction of mine and eventual production will have to be shifted. This may have an impact on quantum of power generation from the targeted power plants. And if the delay causes the power projects to depend on alternative sources of coal, there may be negative economic impacts as well," says Dipesh Dipu, a manager with accounting firm PricewaterhouseCoopers. “Also, there is a signalling effect to other participants in captive coal mining. Delay in NTPC’s Pakri Barwadih project, which will be one of the largest mines in India, is not going to boost the morale of other government-owned and private investors in the sector." NTPC is yet to select the operator for the Pakhri Barwadih block which has gross reserves of 1,350 million tonnes (mt). The company has an overall demand of 115 million tonnes per annum (mtpa) of coal. NTPC imports 4 mtpa of coal to meet its overall requirement. The rest of its coal requirements are met through supplies by CIL. Of the gross reserves of this block, the company believes 70% can be commercially extracted. As per its initial plan, reported by Mint on 9 February, NTPC was to have selected an operator, through competitive bidding, by March this year, and begun production by December. It does not have any expertise in coal mining. NTPC has been quick to blame the coal ministry for the delay. “We have suffered this setback due to the delays by the coal ministry. Availability of land is the main issue which is holding other things up," the executive added. The power major has been allocated eight captive coal blocks by the government. The other blocks given to the company are Kerandari (228mt), Chatti Bariatu (243mt), Chattrasal (150mt), Dulanga (260mt), Talaipalli (965mt), Brahmini (1,900mt) and Chichro Patsimal (356mt). The company plans to invest about Rs10,000 crore to produce 50mt of coal annually by 2013. NTPC believes the coal from these captive blocks will be one-fifth cheaper than what it pays to CIL for current supplies. “By productionising our own coal blocks we will be able to put a new pricing benchmark. This would also mean a huge saving for us," the NTPC executive added. With around 67% of the total power generation currently based on coal, the power sector is the major consumer of coal in the country, absorbing nearly 78% of the country’s total coal production.